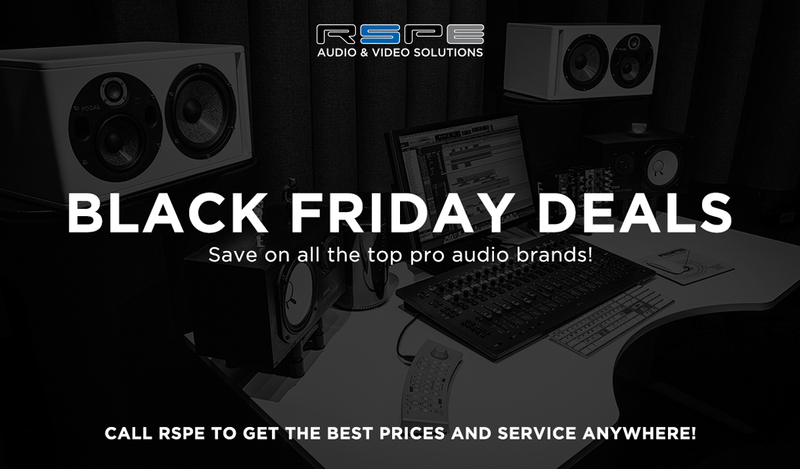 Black Friday Deals are Great, RSPE's Black Friday Deals are even Cheaper! With so many Black Friday deals announced, we wanted you to know that RSPE will honor any deals you've seen on the web and more! Plus, if now isn't the best time for you to buy, RSPE has the best deals year-round, with prices so low we can't even show them on the web. Give RSPE a call at 818.509.5876 to get the lowest prices and best service you'll find anywhere! Take advantage of some of our online Black Friday deals below. For Black Friday, Buy an SSL XL-Desk and get 8 FREE VHD Preamps! That's $5,192.00 worth of ultra-clean SSL SuperAnalogue-grade sound for FREE. Sonnox plug-ins and bundles are on sale at 50% off until Nov 30th, with potential savings of up to 70% off individual plug-in prices (when purchasing a bundle of 6 more)! No need to wait until Black Friday - the Sonnox November Sale has been running all month, and will continue through Cyber Monday (November 30th). Buy an Apollo Rackmount Interface and Get a FREE UAD-2 QUAD Satellite — A $999 Value! FireWire) through December 31st, 2015, and you’ll get a UAD-2 QUAD Satellite DSP Accelerator — Thunderbolt or FireWire — absolutely free! Now until December 31st, 2015, purchase and register an Apollo Twin SOLO or DUO (Mac Thunderbolt or PC USB) audio interface and you’ll be eligible to receive UAD reverb, preamp, and guitar effects plug-ins free! Buy an Apollo Twin SOLO (Thunderbolt Only) — Get the EMT 140 Plate Reverb Plug-in and Bermuda Triangle Distortion Pedal Plug-In FREE! 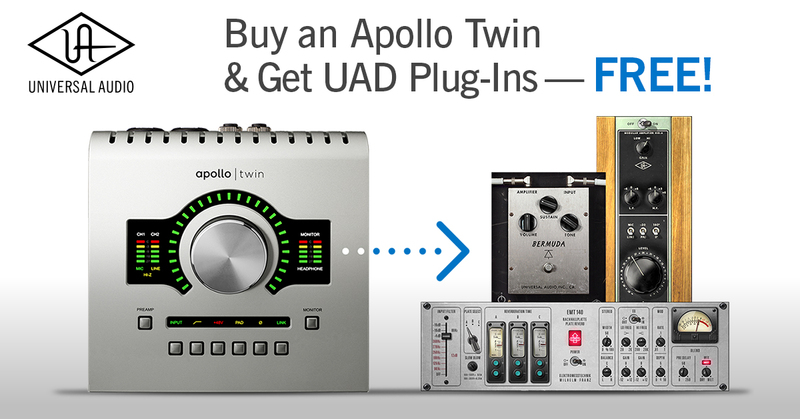 Buy an Apollo Twin DUO (Thunderbolt or USB) — Get the UA 610-A Tube Preamp Plug-In, EMT 140 Plate Reverb Plug-in, and Bermuda Triangle Distortion Pedal Plug-In FREE! Shop UA Apollo Twin Deal. Lynx Black Friday and Cyber Monday Week Sales! Save up to $300 on Lynx's Aurora 8, Aurora 16, and Hilo Audio Interfaces through December 5th. Shop Lynx Aurora and Hilo. Between now and January 1st, 2016, buy Zynaptiq's ZAp Bundle and get Morph 2 and NUMEX::DRUMS free! Save 60% on McDSP Individual HD and Native Plugins through November 30th! Save 25% on Fabfilter Individual Plugins through November 30th!